Squirreled away in a secret room within Monstro Town, a cliffside hamlet in Super Mario RPG, there’s a purple-skinned warrior named Culex. You can go the whole game without ever meeting this man; finding him requires you to backtrack to an earlier town, purchase a pricey set of fireworks, and trade it to an NPC for a crystal that opens the door to his lair. Once you do find the enigmatic knight, he challenges you to a duel. Accept the offer and you’ll have to face down a boss more challenging than any other in the game. This article was originally published in March of 2016. We’ve bumped it up to celebrate Super Mario RPG coming out for Wii U Virtual Console. Difficult sidequests like that—sidequests that a fraction of players will even discover, let alone complete—are rare in Nintendo games. 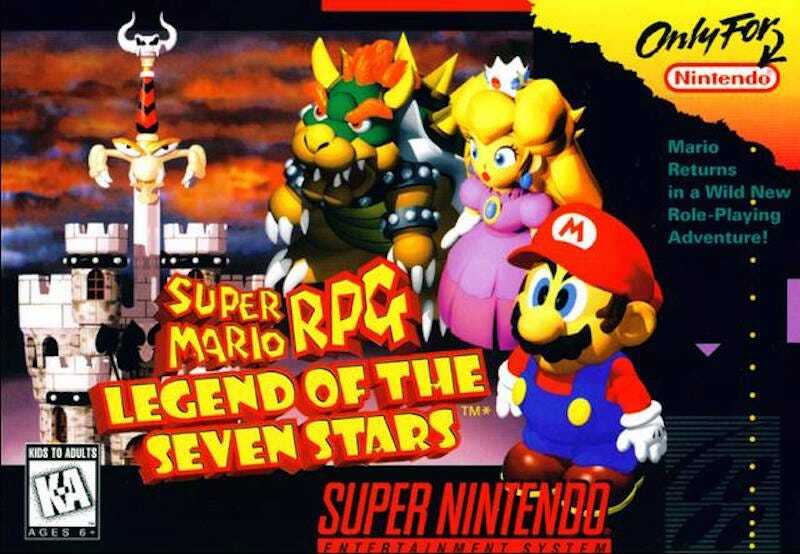 But Super Mario RPG, which turns 20 today, was no ordinary Nintendo game. It’s hard not to find fans of SMRPG, a 1996 collaboration between Nintendo and Squaresoft that inserted the ubiquitous plumber into his very own Final Fantasy-like role-playing game. Blending Square’s intricate gameplay systems with an original story starring the goofy denizens of the Mushroom Kingdom, Super Mario RPG was a dream mash-up. Players loved everything about it—they loved the world, the music, the way it guided them through a story that always felt epic, yet never took itself too seriously. At the time, it felt like Mario and RPGs would make a natural partnership for years to come; they went together like chocolate and chunky peanut butter. Sadly, Nintendo and Squaresoft weren’t nearly as compatible. Square ditched the N64 and its antiquated cartridges for the lure of Sony’s PlayStation, and the companies’ relationship was never the same. Super Mario RPG 2 never happened, but Nintendo kept making Mario RPGs, flattening their plumber for the creative Paper Mario series and adding his brother to the mix for the portable Mario & Luigi games. There have been nine role-playing games featuring Mario since the days of Super Mario RPG, each with its own set of gimmicks. Some of them are excellent; others are less excellent. Few of these games have lived up to Super Mario RPG. Over the past two decades, none of Mario’s other RPGs have had characters as iconic and memorable as Croco the thieving lizard or the magical doll Geno, who is requested for Smash Bros. so frequently, the creators of Nintendo’s fighting game added a costume just for him. The closest Nintendo came to recreating the greatness of Super Mario RPG was on the GameCube, with Paper Mario: The Thousand-Year Door, a game that embraced its RPG heritage full-on, rewarding the smart, curious player with all sorts of secrets including items and party members. For whatever reason—soft sales, bad reviews, Miyamoto’s distaste for story—Nintendo wasn’t satisfied with The Thousand-Year Door, and they spent the coming years taking Paper Mario in a totally new direction. In 2007 they released Super Paper Mario, a Wii game that ditched turn-based combat in favor of real-time platforming. A few years later came Paper Mario: Sticker Star, a game that was less RPG and more point-and-click adventure. With no level system, few interesting locales, and an emphasis on trial-and-error rather than strategic combat, Sticker Star was generally seen as a miss for the series. Last week, Nintendo announced Paper Mario: Color Splash, and reactions have been just as tepid. We don’t know much about it yet, but early footage appears to show that same focus on action over role-playing. Outspoken RPG fans are actively wondering why the series has ditched what people loved so much about The Thousand-Year Door and Super Mario RPG before it. As many have pointed out, today’s Mario RPGs don’t have the impact of their SNES ancestor. It’s not just nostalgia talking. Even today, Super Mario RPG holds up as a stellar example of what role-playing games can do. It subverts expectations, encourages clever thinking, and never fails to make the player laugh—I’ll never stop enjoying the in-joke of Mario, the silent protagonist, wildly gesticulating to explain various plot developments. And I’ll always enjoy challenges as rewarding as the Culex fight, with or without Final Fantasy music. Happy 20th birthday, Super Mario RPG. Maybe one day, we’ll see a game like you again.